However much sailors love being at sea, landfall after a long passage is always sweet. When Jimmy woke me early in the morning of Friday 5th September, I rubbed my eyes and stared in wonder at the green Newfoundland coast. Finally, after two months, I get to see trees again! Aventura by now was happily clocking 7000 nautical miles on her log, an impressive figure when you think she only left on her adventures at the end of May, some three months ago. I’m proud to say I’ve done 3,500 of those, a great loop from Greenland north to the High Arctic and back sliding south to our new destination, St John’s Newfoundland. Coming here was never part of our original plans, so we are arriving in complete ignorance other than what we can see on the electronic chart. On watch last night (my final night watch, I am definitely not going to miss those!) I watched the lights from the city whiten the horizon, but now all I can see are rocky cliffs and no buildings or any way in. I wonder if I was dreaming. A cheery contact from Port Control on VHF Channel 11 instructs us to come in behind a large oil tanker, and we watch in amazement as she slips between two rocky spurs and vanishes completely from view, swallowed by the land. 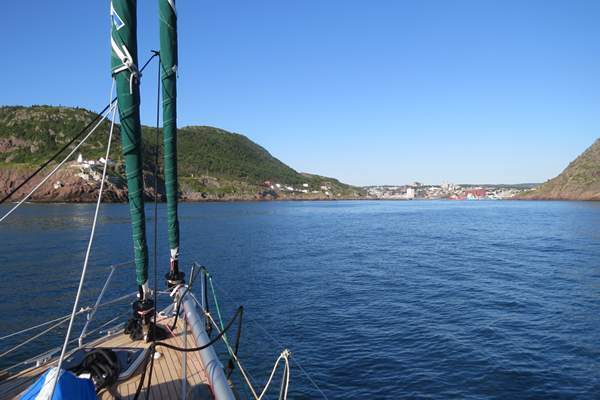 St John’s is a perfect landlocked harbour – no wonder this site was chosen on the easternmost point of North America, a key place in the earliest history of this mighty continent. The earliest explorations west from Europe, seeking the fabled north and a way through to the Pacific, touched here first – an appropriate place, then, for us to come to the end of our own Northern adventure. We are soon docked on Queen’s Wharf, right in the centre of the old historic town, a stone’s throw from the beach where in 1583 Sir Humphrey Gilbert landed and claimed it for Queen Elizabeth thereby founding the British Empire. We’re dwarfed by giant ships that service the offshore oil industry: once seals and fish, now oil is the natural resource powering St John’s economy. Our new crew are waiting to welcome us with fresh pastries for breakfast: Lou Morgan, who will be sailing the Blue Planet Odyssey Northern route in 2015 with his family, on their own Garcia 45, and Ryan Helling of Swiftsure Yachts, who represent Garcia in the USA. I’ll be happy to relinquish crew duties to these guys, they are fresh and enthusiastic and soon prove their worth with a busy day of fixing things on Jimmy’s long to-do list. A thousand miles takes a toll on any yacht, and we need to be sure Aventura is ready for the next 1000 miles as she heads south to Newport, Rhode Island. 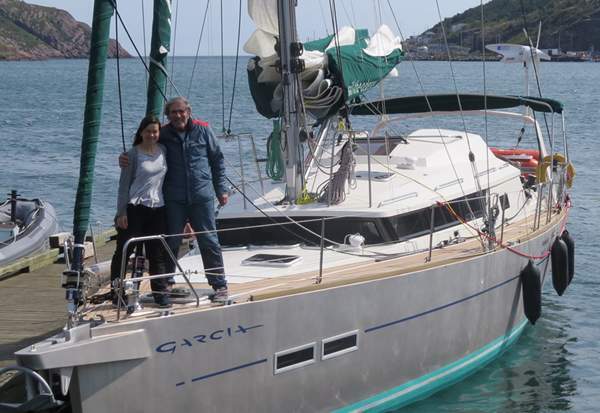 A boatyard and a rest, a little TLC, will be waiting for her there, and she has certainly earned it. Ryan gives me a hand to take the laundry up the street, and we pass cool young people sitting out under the trees sipping cappucchinos. A world away from Arctic Bay where we were a bare month ago. Same country, but so far away. I’m feeling over-stimulated now by new sensations, and best of all, it is so warm I can go barefoot on the boat. After two months of two layers of thermal socks, my feet at least are happy. ‘You owe me dinner in the best fish restaurant in St Johns,’ I’d made Jimmy promise during one particular wet and windy episode as I had to handsteer while he switched from the main to the spare autopilot. True to his word, he takes his crew out for a delicious dinner of halibut, a local speciality. All too soon is it Saturday morning and they are ready to go. I don’t envy them. I’ve checked into a hotel as my flight home leaves Sunday, and strong southwesterlies are predicted, right on the nose…. And yet, when I hug my father goodbye, and watch the boat steam fast out of The Narrows, my home for two months, she turns right, going south, and she is gone… there is a little bit of regret. I have family and work I must get back to, and yet, it has been a grand adventure. He’s right, we did pretty good. Exactly forty years ago this summer when I was seven years old, my dad took me sailing. 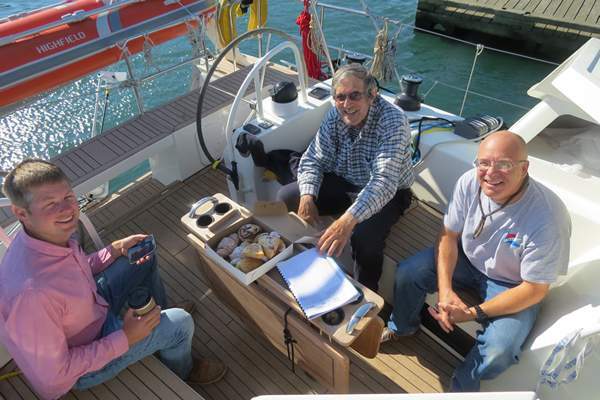 Nice to still be sailing together, forty years on.